In this heart-pounding thriller from acclaimed writer and director Mike Flanagan (Oculus, Before I Wake), silence takes on a terrifying new dimension for a young woman living along in the woods. Author Maddie Young (Kate Siegel) lives a life of utter isolation after losing her hearing as a teenager. She’s retreated form society, living in seclusion and existing in a completely silent world. But one night, the fragile world is shattered when the masked face of a psychotic killer appears in her window. Without another living soul for miles, and with no way to call for help, it appears that Maddie is at the killer’s mercy… but he may have underestimated his prey. As this horrifying game of cat and mouse escalates to a breathless fever- pitch, Maddie must push herself beyond her mental and physical limits in order to survive the night. Yea! That time of year is fast approaching. All things pumpkin, sweater weather, bonfires, scarves and Halloween. Which means SCARY MOVIES!! I have seen my fair share and will continue to recommend as many as I can. The weather has cooled in my area, so I immediately searched Netflix for a scary thriller flick to pass the time. 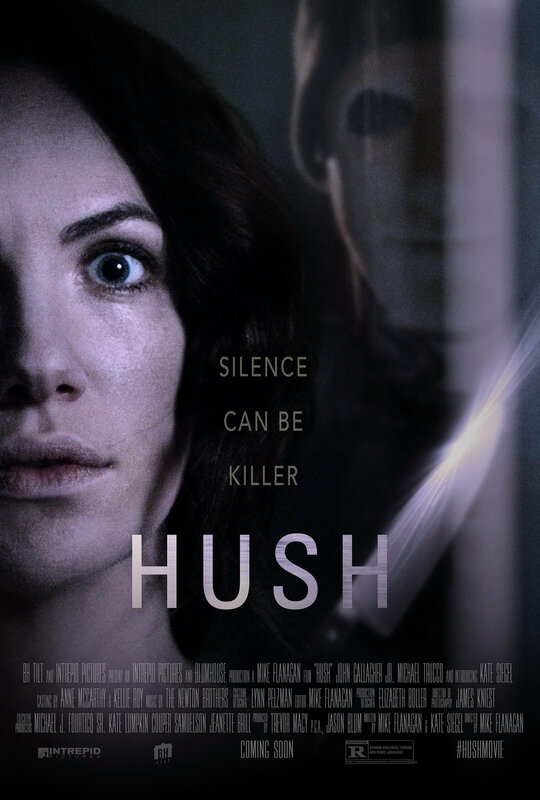 HUSH came up as an option and I have been dying to see it. Without giving too much away, this is a stellar movie. The added element of being deprived of a crucial sense makes this movie a perfect thriller. Maggie moved into this picturesque cabin in the woods. Large beautiful windows, great kitchen and living room space, beautiful gorgeous claw foot tub to soak in. Really, every moms perfect retreat. She is working on her next breakthrough novel, with a glass of wine in hand when everything goes to hell. Throughout the movie the sense of sound is given, then taken away. That aides in the true feel of terror that she must be going through. The mind games that the killer plays is such a suspenseful mind f*ck that you are on the edge of your seat most of the time. There is a turn of events, that leaves you gasping for air. I give this movie 4 1/2 stars. There were some predictable scenes but otherwise a great watch. However, I DO NOT recommend watching this while you are home alone on your weekend retreat in the woods. A little too scary to bare. Previous Rules For Turning My Boys Into Gentlemen. Next Netflix and Chi… WHAT? ?